International Christian Tennis Association: Bryan Brothers and Snelen Sisters Play at Legg Mason Tennis Classic In Washington, DC!! Bryan Brothers and Snelen Sisters Play at Legg Mason Tennis Classic In Washington, DC!! Some matches are made in Heaven! Hello there. 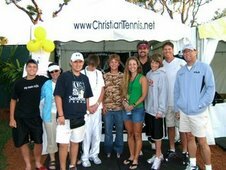 This is Scott Paschal, founder of the International Christian Tennis Association, www.christiantennis.net. I'd like to update you on our latest ICTA Mission Trip. 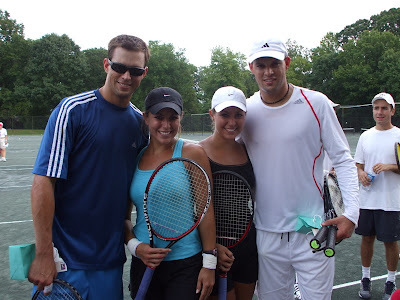 Here is a great picture of Bob Bryan and Rachel Snelen (lt) with Mike Bryan and Melody Snelen (rt) taken in Washington DC at a US OPEN SERIES tournament called the Legg Mason Tennis Classic. Bob and Mike played main draw men's doubles, while Rachel and Melody played main draw women's doubles. We're doing some research to see if this was the first time in history twin guys played the same tournament as twin girls! Rach and Bob played against each other for fun during the event. William H.G. FitzGerald Tennis Center in Rock Creek Park and benefited the Washington Tennis & Education Foundation. 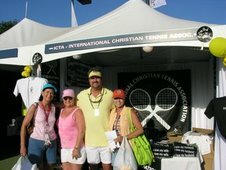 In prayer, the International Christian Tennis Association made the decision to send the ICTA Women' s Pro Tennis Team to compete in this fabulous event. Rachel Snelen, Melody Snelen, and Emma Hustad represented the team, which is the first and only of its kind in the history of tennis. The entire trip was God-blessed from the first minute until the last. I'll touch on a few of the highlights here, but know we are preparing an entire ICTA Video production to share this God-blessed mission trip to the largest audience possible in hope of inspiring people worldwide. With a week full of Divine appointments, these wonderful women reached among the most famous ATP players in the world with one on one conversations about faith. They had the amazing opportunity to room for the week with a really special player (who was not a Christian!) and feel God work. Rachel and Melody were offered professional coaching by one of the most famous tennis players in the history of the sport... for free. He is a Grand Slam champion and both girls are excited at the opportunity to be able to call him anytime, meet him at his home, and learn from his vast knowledge. Rach and Mel lost 6-0, 6-0 in main draw doubles. But, the positive of the loss was the match was competitive as the Snelen sisters played the #1 seeds, who are top 100 WTA players and compete in Grand Slams. Their new Grand Slam Champion friend feels with his help they could more strongly compete at this level. As their many injuries over the last 2 years are healing... I am excited to see God continue fulfilling the dreams the twins have had since childhood! The connections the girls made throughout the entire event have been astounding. Everyone noticed them and God blessed the entire trip. What's next for the ICTA Women's Pro Tennis Team!? They are flying to Israel on Friday. So exciting for ICTA to send a team of professional athletes to share Christ and serve hard in Jerusalem. I'll write more on this upcoming mission trip soon. 6 member pro player missionary team travels worldwide to share their faith. ICTA Staff, students, and parents at world's 5th largest pro tournament. US Men's Claycourt Championships. 100's of Bibles, Books, T-shirts, Tracts, etc given away!